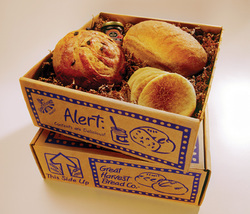 Show your out-of-town family and friends what they are missing with box of fresh Great Harvest breads delivered to their door. We ship on Tuesday or Wednesday via USPS Priority Mail. Call for shipping box prices. ​Stop in the bakery and we will help you put together a custom box your family and friends will love!